HTML5, the next major revision of the HTML standard, has given us the ability to support file uploads via the web interface using drag and drop. 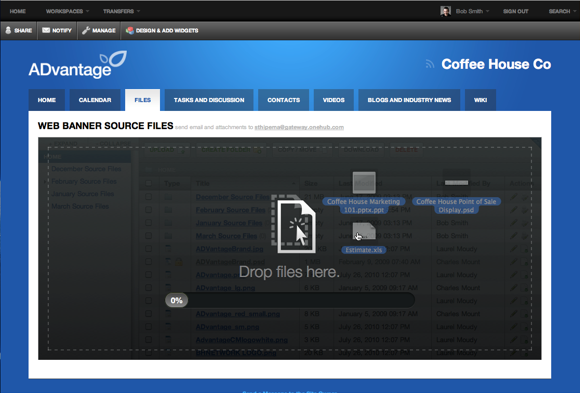 You can now simply drag and drop files from your desktop to your Workspaces. The simplicity of this new feature makes file sharing and online collaboration a breeze. Right now, this feature is available in Chrome, Firefox, and newer versions of Safari. We have heard rumors that Internet Explorer 9 (which is currently in Beta) will support HTML5 including drag and drop. However, if you want to try this out now, download one of the modern browsers I mentioned above. We can’t wait to hear your thoughts on this cool feature. We hope you are as excited as we are. Tell us what you think by commenting on this post. I tried this with a folder of files and it did not work. Yes, this only works with one or more files- unfortunately HTML5 does not permit users to drag folders into the browser. any file size cap for this feature? Right now, it’s only capped by the maximum file and storage sizes on your account. We haven’t tested the upper limits though, so it’s possible that a gigantic file could cause issues… and right now our backing store puts a hard upper size limit on files at 5GB. Try it out though– I’m curious to know what size files you’re able to successfully upload! How about if you have a folder with a GB of files in it, but you zip it to a single file… that should work? Yes John, that should work… note though that the zip file won’t be decompressed once it’s uploaded, so a user of the workspace would have to download the entire file in order to get access to its contents. Made me curious! An where can I download the files? Hi. Do you anticipate a version that works in IE? Perhaps in IE10? This uploader should be compatible with Internet Explorer 10- we check the capabilities of the browser rather than the version, so any browser with the necessary capabilities should be supported automatically.